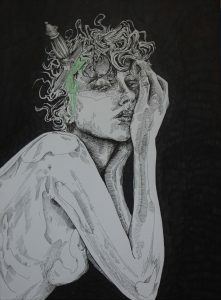 About the artist: I am an 18 year old artist from Almaty, Kazakhstan, living and attending school in NYC. I am currently studying design in the Fashion Institute of Technology and working on illustrations and fine art on the side. My art currently aims to address the issues of at times overwhelming beauty standards put on women and the struggles of self love that often come along with it especially during the transition period from childhood to adulthood. Such things could often either be pushed aside and ignored or overly emphasized and lead to devastating negative effects. With this self portrait, I want to reflect on some internal struggles tied with such negative thoughts and show a certain beauty in this particular struggle.